After we met Satoshi's new friends, here's a new preview for the upcoming fifth Pokémon anime series Pocket Monsters XY which was first seen during last Sunday's Pokémon Smash. 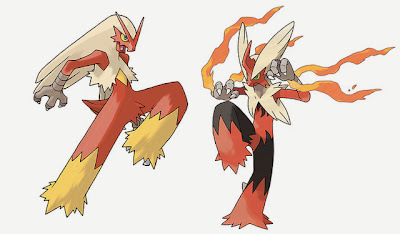 This shows a short appearance of Mega Blaziken. Satoshi (Ash) and Pikachu will travel to Miare City (Lumiose City) at the center of the Kalos region. Pocket Monsters X and Y starts airing October 17th in Japan. It will also be aired in Cartoon Network alongside the most recent Pokémon film, Pokémon the Movie: Genesect and the Legend Awakened, on October 19th. It is to be noted that a Torchic holding a Blazikenite will be given away for a limited time via Wi-Fi. In Pokémon X & Pokémon Y, your adventure takes place in the Kalos region, home to beautiful skies and forests! It will be available for the Nintendo 3DS, and are scheduled to be released worldwide this October 12th. Pre-order now at Play-Asia and get FREE SHIPPING!